Zebrafish (Danio rerio) belonging to the family Cyprinidae, are a group freshwater fish that have become an ideal model organism for a variety of fields of study. When maintaining zebrafish as a research specimen, water quality is pivotal for success and quality research. 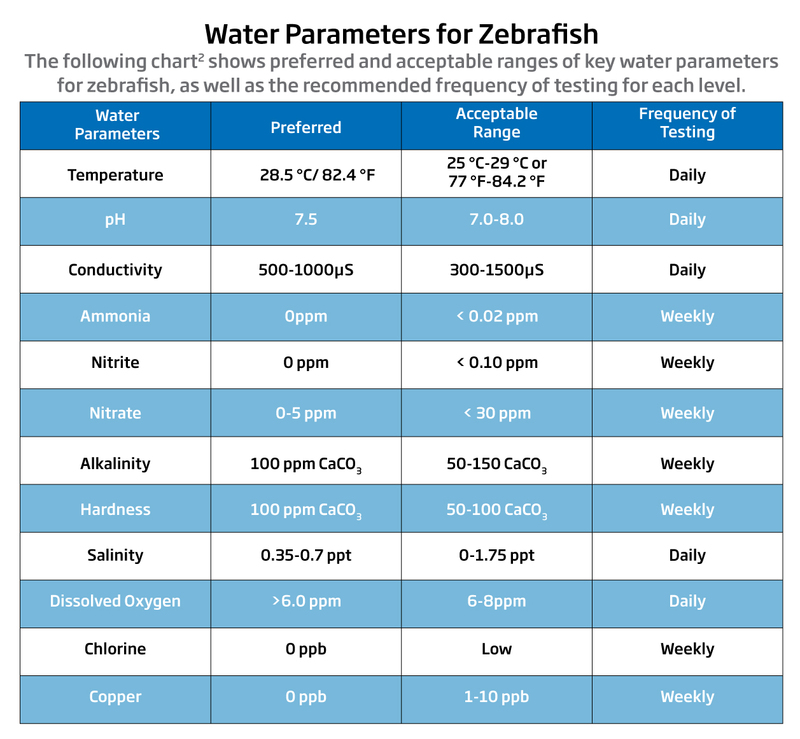 Read more below to learn about ideal water parameters to maintain a zebrafish facility, various problems associated with poor water quality and ways to dependably analyze necessary parameters. Why Zebrafish as a Model Organism? A model organisms is a non-human animal used in research. Zebrafish have gained much popularity as a research organism for a variety of disciplines such as genetics, pharmacology and biological research. This is due to a number of reasons including their high fecundity, production of transparent embryos, cost effectiveness, similarities to humans, as well as an abundance of available data. In addition the larvae and embryos of Zebrafish develop externally and at a rapid pace compared to some other model organisms. This allows for manipulation and observation of early life stages to be less difficult. The embryos of Zebrafish are able to absorb additives from the water, with a high tolerance to chemical mutagens, allowing for easier administration of chemicals at greater dosages. Zebrafish are substantially easier to care for compared to rodents and their small size allows for creating a more natural environment inside the lab, which can minimize stress. Minimizing stress is ideal for research organisms as stressful conditions can impact experimental results. Maintaining water quality is a key component to reducing stress for zebrafish.1 Thousands of zebrafish can be housed in a single system and large quantities of fish can be maintained and kept in a laboratory with ease. When housing and maintaining zebrafish, small aquariums are usually connected and housed on racks linked to a filtration system. These systems can contain various filter components such as a ultra-violet sterilizer, activated carbon, bacterial media and small micron mesh filters. Numerous racks can be maintained in a lab, occupying a relatively small footprint for a large number of organisms. Water quality is the most vital aspect of maintaining a proper environment for your zebrafish. Water quality is the most significant factor for the health and well being of your zebrafish. Unsuitable water quality parameters can have deleterious effects on your research organisms. From increased stress, likelihood of contracting diseases and negative impacts on breeding can all occur if water quality is not properly maintained. Zebrafish are eurythermal4 meaning they can withstand a diverse range of temperatures. Ideally one should keep their specimens at a 28C/82.4 F, levels below this may cause decreased metabolic activity and a lower production of offspring. Levels above this can damage vital internal functions or decrease the total availability of oxygen in your system. Phosphates are also important to monitor in a zebrafish system. Elevated phosphates usually results from excessive feeding. This can lead to algae growth inside the tanks housing zebrafish specimens. Nuisance algae can restrict visibility of specimens and can impede critical visual observations necessary in daily monitoring of your zebrafish. Contaminants also play a role in the health of your zebrafish and reducing introductions of pollutants such as copper and chlorine is critical for success. Copper can enter water systems from a number of ways including piping, especially newer plumbing.5 Copper is particularly toxic at low levels and thus is it important to minimize the amount of copper found in your zebrafish system. Copper toxicity can cause decreased immune response from a slowed antibody production, leading to an increased susceptibility of infectious diseases. In addition exposure to toxic levels of copper can cause stunted sexual development, causing teratogenic effects, reducing the total egg production and lower survival rates of progeny. Monitoring chlorine is also of great concern to maintaining a zebrafish system. Chlorine is toxic to most fish at acute levels thus having an adequate dechlorinating process is key to aquatic animal health. Sodium thiosulfate is often used to treat municipal water and static systems. But monitoring chlorine levels is best practice to ensure proper neutralization is achieved. Symptoms of chlorine toxicity can include necrosis of the gills, leading to respiratory problems and asphyxiation. Chlorine toxicity can be noticed from inflamed, brightly red gill coloring. It is best to include chlorine analysis as part of your regular testing process. 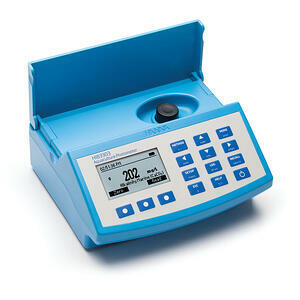 Getting the right instruments for your lab is crucial to accurately test your water parameters. Having reliable instruments to analyze water quality is a crucial aspect of a zebrafish lab. We manufacture a wide range of analytical instruments to confidently test your water. HI83303- Aquaculture Photometer Our HI83303 is a compact, multiparameter photometer perfect for use in zebrafish laboratories. The meter is one of the most advanced photometers available with an innovative optical design that utilizes a reference detector and focusi ng lens to eliminate errors from changes in the light source and from imperfections in the glass cuvette. This meter has 20 different programmed methods measuring 12 key water quality parameters and also offers an absorbance measurement mode for performance verification and for users that would like to develop their own concentration versus absorbance curves. Parameters measured include freshwater alkalinity , marine alkalinity, low-range ammonia, medium-range ammonia, high-range ammonia, calcium freshwater, marine calcium, free chlorine, total chlorine, low-range copper, high-range copper, nitrate, marine nitrite, low-range nitrite, high-range nitrite, dissolved oxygen, marine ultra –low-range phosphate, low-range phosphate and high-range phosphate. 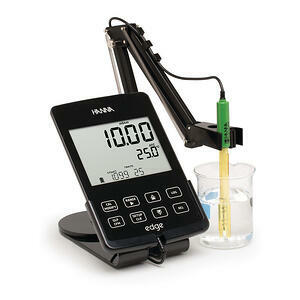 In addition the HI83303 doubles as a professional pH meter with its digital pH/temperature electrode input. The meter also has data logging where up to 1000 photometric and pH readings can be stored by simply pressing the dedicated LOG button. The HI83303 allows you to save valuable laboratory space by creating a compact, accurate and easy to use photometer that satisfies most of your testing needs. HI2030- Edge Multiparameter EC/TDS/Salinity Meter Our HI2030 Edge Multiparameter Meter is capable of measuring pH, Dissolved Oxygen, Temperature, Salinity, Total Dissolved Solids and Conductivity. This Laboratory grade meter is only 0.5”, weighs less than 9 ounces, has a large easy to read LCD display and features our capacitive touch keypad that gives a distinctive, modern look. Since the keypad is part of the screen, your buttons can never get clogged with sample residue. Which can be a common problem in a wet lab. Edge allows you to store up to 1000 log records of data. Data can be logged on demand (200 records), on stability (200 records), or at a predefined interval (600 records). The information stored include current reading, date, time and Good-Laboratory-Practice data. Data of the last calibration you perform is stored in the sensor: electrode’s offset, slope, date, time and buffer/standards. When any sensor (pH, EC, or DO) is connected to the edge, GLP data is automatically transferred. Edge digital electrodes are highly advanced, featuring a built-in microchip that stores calibration information that is automatically retrieved by edge once the electrode is plugged in. These digital electrodes also feature an easy to plug in 3.5 mm connector so you never have to worry about the right angle or aligning pins. 1Reed, Barney , and Maggy Jennings. "Guidance on the housing and care of Zebrafish (Danio rerio)." Research Animals Department, Science Group, RSPCA (May 2011): pg. 26. Web. 25 Dec. 2016. Martins, R.N. Regular Care and Maintenance of a Zebrafish (Danio rerio) Laboratory: An Introduction. J. Vis. Exp. (69), e4196, doi:10.3791/4196 (2012). 4 Reed, Barney , and Maggy Jennings. 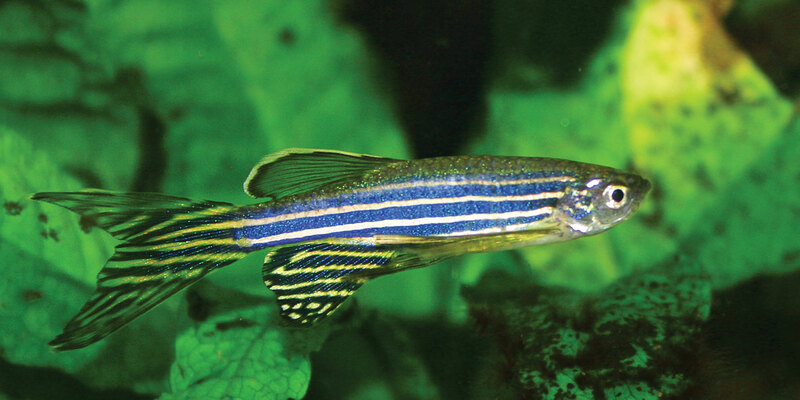 "Guidance on the housing and care of Zebrafish (Danio rerio)." Research Animals Department, Science Group, RSPCA (May 2011): pg. 24. Web. 25 Dec. 2016. 6 Zebrafish International Resource Center (ZIRC). 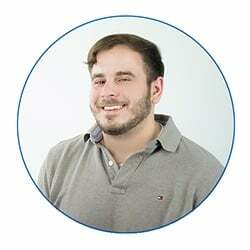 "Water Quality Problems." Www.zebrafish.org. ZIRC, 6 Apr. 2016. Web. 26 Jan. 2017.